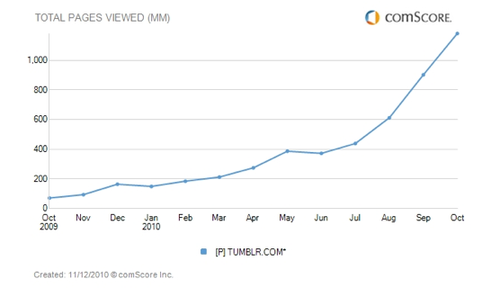 Erick at Techcrunch sent me this chart yesterday and asked me why Tumblr was growing so fast. I guess it was related to this post he wrote about Tumblr yesterday. I told him I had no idea but I could make an observation. My daughter came home from college on thursday night and showed me all of her friend's Tumblrs. All the cool kids have them at her school now. Had nothing to do with me. I can assure you of that. They use Facebook as a utility. They check Facebook when they wake up and check it before they go to bed. But their profile on Facebook looks just like everyone's profile. A Tumblr is self expression. Jessica's looks different than Emily's, mine and the Gotham Gal's. That's powerful. And that is what I think is driving Tumblr's popularity. Self expression matters.